Born February 23, 1893 in Buffalo New York, Chester Oakley is the architect responsible for several of the buildings on the St. Bonaventure campus. Son of Edward and Theodora, Oakley learned how to draw from his mother at age four. Oakley's road to becoming an architect was somewhat unorthodox. He ended his formal schooling in ninth grade. At sixteen he got a job as a designer in an architect's office. His rich talent quickly gained wide recognition and in just ten years he was operating his own office. Oakley specialized in 12th century Lombardic style architecture much like that of northern Italy. In 1926 he was summoned by Father Thomas Plassmann to erect a dormitory to be named after Nicholas Devereux. Construction on Devereux Hall was completed in 1928. During the construction of Devereux hall, he was also asked to build The Stations of the Cross and St. Joseph's Oratory. 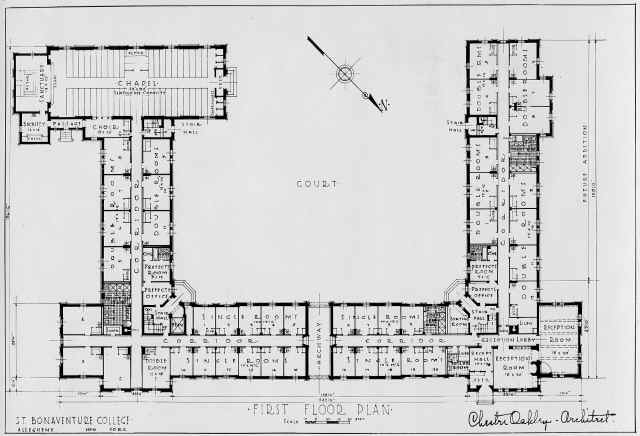 After the fire in 1930 which burned down the original Monastery and Church, Oakley was asked to add another wing to Devereux Hall, and began plans for constructing the Hickey Memorial Dining Hall. Three years after the great fire, Lynch Hall, previously known as the College Building, was struck by lightning. Oakley was called upon once again to design the renovations and the finished product is now known as De La Roche Hall. Four years later, in 1938, Oakley made his final contribution to the St. Bonaventure campus with the Friedsam Memorial Library. Other works by Oakley include the Blessed Trinity Church in Buffalo and the Franciscan House of Studies at Holy Name College. However his most prestigious work was that of the Shrine of the North American Martyrs in Auriesville New York. Oakley said that this building "gave me my reputation." Just off the New York State Thruway, the shrine has 72 doors, seats 6500 people and can be emptied in seven minutes. Oakley was described by people who knew him has a perfectionist who loved his work. He was also a heavy smoker. He smoked two to five packs a day depending on whether he worked through the night or not. After his wife died in 1958 he lived by himself in their trailer in Kill Buck. There he is remembered as a lonely, fragile man who walked daily to the corner grocery-post office for a bit of conversation and companionship. For the last five years of his life he lived in Olean. A scribbled note written by Oakley found in the Friedsam Archives writes "Tell him I want to live down here close to the Friars and not get into the worldly life." 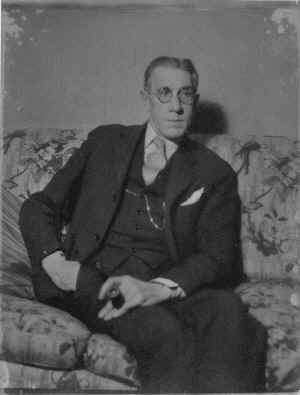 Finally, after battling a lung ailment, Chester Oakley died in St. Josephs Manor Hospital on July 23, 1968. He was seventy-eight. This page was created by Andrew Hart as part of an internship during the Spring 2006 semester. Any changes, other than minor editing, are noted at the bottom of the page.